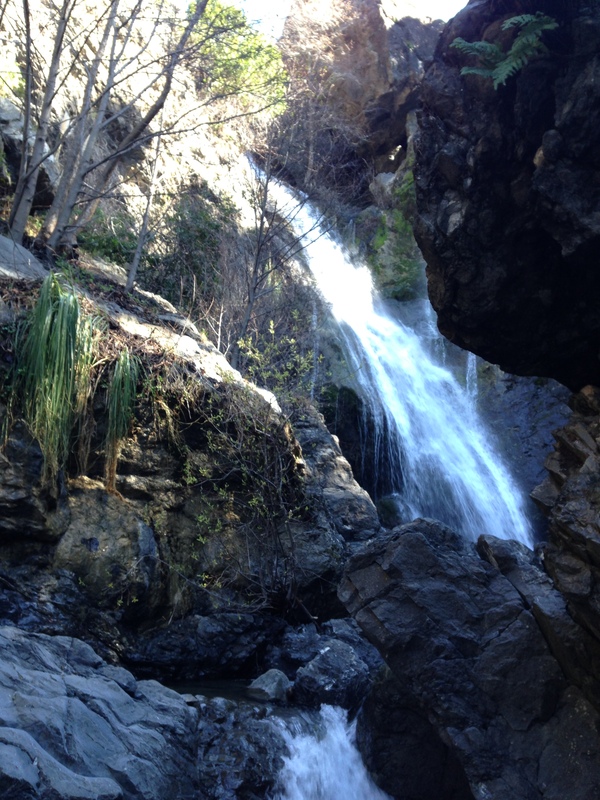 Last weekend, my friend Randall suggested we hike Salmon Creek Trail. So Megan and I went hit the road, with Randall of course, to find Salmon Creek and this supposed waterfall he had been talking about. According to him, it was south of Big Sur and right off the Pacific Coast Highway. For those that have never been, the PCH, or HWY 1, is a killer drive. Since it’s curvy and the views are gorgeous, it takes quite a bit longer to get from A to B. So if you need to be some where soon, get on the 101 and stay off the 1. It was just like Randall said, about an hour north of San Luis Obispo and right off the highway on an inside curve with limited parking. If you’re not paying attention, you could miss it. The trail leads to mountains with beautiful ocean views and other sights we didn’t see. Randall, a veteran CCC (California Conservation Corps) member, knew something truly gorgeous and unique about this little trail off the PCH. “You see that waterfall,” he asked, pointing to the large and beautiful body of water dropping endlessly off the mountain, “we’re going to hike up there and find a cave right inside.” I look at Megan, she looks at me, we look at Randall. “Oh yeah, you’ll be fine.” I look back at Megan, she looks back at me, we look at the car. 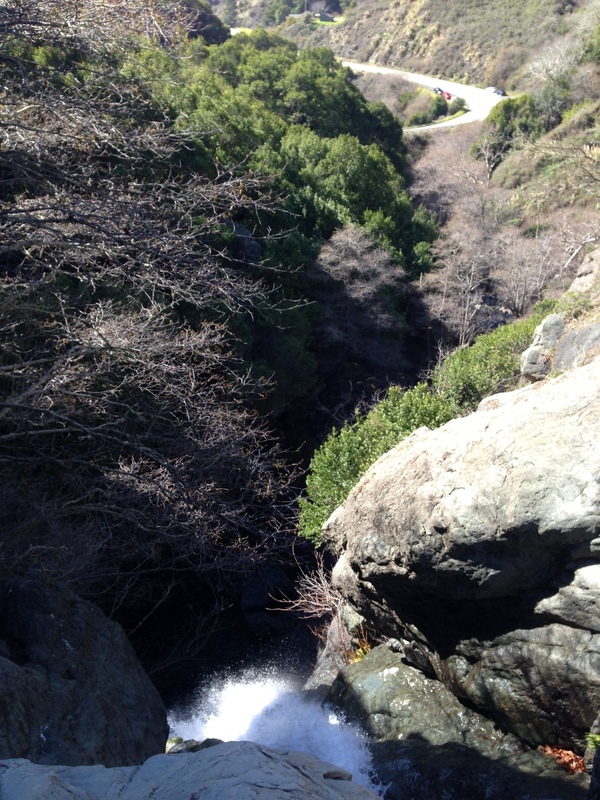 Besides a few steep moments, the hike wasn’t too bad; in fact, it was quite fun. 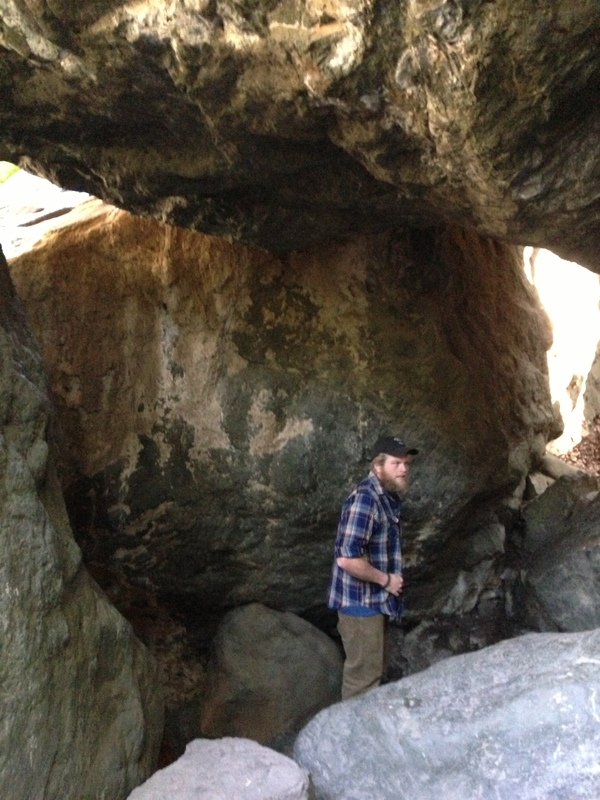 I was climbing over giant boulders and exploring the wild in ways I’ve only read about. I hadn’t felt this way since I was four years old and climbing in the McDonalds playground, except this time, NO PARENTS. Randall was an excellent guide, quite the sherpa really. Every time I thought we were lost, he proved me wrong. A few times I worried about the safety of my wife, not because of her hiking and climbing skills, but because it had rained the day before and the earth was not quite fit for an outing like ours, in the shoes we were wearing. Megan did great though, I was proud. Randall squeezed himself through the hole and into the cave. “Come in on your stomach,” he yelled from the echo-y chamber, “there’s rocks for your right foot, I’ll guide you!” I looked at Megan, she shook her head, I looked at the hole. I squeezed in and left Megan to overlook the waterfall. 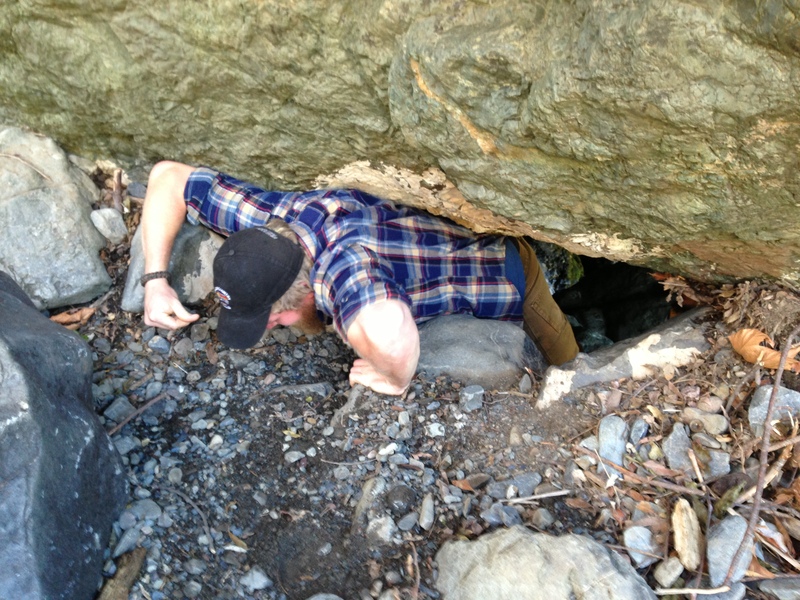 Randall guided me in and again, it was just like he said: drop down and your right foot will hit a pile of big rocks. Though he didn’t tell me the top one was wobbly. What I saw inside the cave was absolutely breathtaking. Immediately, I was drawn in to a Tolken story or something magical along those lines. The cave walls were covered in fresh green moss with plants and flowers for the trim. The waterfall fell on both sides of the opening and we looked out. I grasped for my phone but it was left with Megan; we didn’t want to damage it sliding in to the cave. I regretted not having it, though I knew this place was too special to be captured through an iPhone camera anyways. It now only lives in my memory and it’s fine that way. I guess, without the picture, I’m more prone to go back and relive it someday. I’d go on, but that’s the meat the story. I hope you can make it there, it’s truly a special place. I have yet to see Big Sur. I was gonna stop there but it rained heavily when I was passing by. It’s nice to see water in the waterfall. These days sure is the best times to hike. When it’s summer, the falls dry up. Your caving experience is so adventurous, reading it makes it even more convincing to go to.